Discover one of the most beautiful and most varied parts of Africa. expect flourishing regions, breathtaking mountain ranges and impressive game and nature reserves, flanked by sheer cliffs where eagles nest and crystal streams trickle by. There is an abundance of bird life, including owls, swallows, loeries, guinea fowl just to name a few. One can watch the monkeys on the adjacent cliffs, sunning themselves or playing on the rocks. Enjoy a little bit of luxury far from the hustle and bustle of city life with beautiful, peaceful surroundings beneath South Hill, the imposing mountain that cradles this quaint village. Whilst at the heart of an unusual historical area, the region is also renowned for its fresh escarpment air and exceptional night skies. There are also countless natural locations. These include mountains, forests, waterfalls, world-renowned views, and outstanding flora and fauna. To top it all, being situated on the edge of the Drakensberge escarpment, provides breathtaking views and spectacular scenery. After decades of staying in Europe these impressions have brought us back to South Africa. 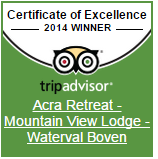 We chose the location for this very carefully; we were simply delighted with Waterval Boven. Share our enthusiasm and let yourself be intoxicated by the African flair. Acra-Retreat ** Mountain View Lodge** is situated on the Highlands, built on the edge of a cliff with BREATHTAKING VIEWS of the mountains. Pure relaxation! You feel at one with nature but not cut off from the world. 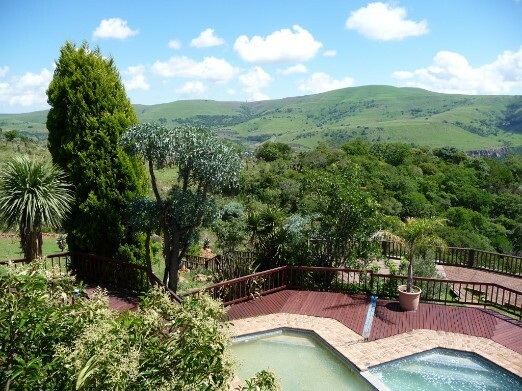 Your "Holiday Lodge" is 0.4 km from a small and picturesque railway town called Waterval Boven, which has an impressive history and friendly residents. 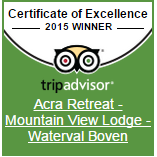 Waterval Boven translates as "above the waterfall " and the name promises a lot. Visiting the spectacular waterfall is a must! Do You want to visit the Kruger National Park, God ´s Window, Kaapschehoop or to the Blyde River Canyon? Then you have made the perfect choice. Our Lodge is conveniently located on the route to all tourist attractions and natural wonders of Africa in this beautiful province. Whether you are planning a stopover, a base station or a longer stay with us: You will always be welcome. Discover the beauty of the environment. No matter where your interest lies ... nature enthusiasts, history enthusiasts, explorers or connoisseurs or just relaxing ... there is something for everybody. Mpumalanga means "City of the rising sun" and it deserves its name. Escape from the hectic everyday life and enjoy the friendly and uncomplicated South African way of life.